INSET: Book cover and author’s portrait © Christina Heinrich, H2 Fotografie. IN A.D. 793, hitherto unknown Nordic warriors swept out of Scandinavia like a firestorm and laid waste to the English monastery at Lindisfarne to begin what scholars have called the Viking Age. The Vikings have long been known for their less than reputable history as raiders and plunderers, but they excelled in shipbuilding, exploration, trading, war, and art production. 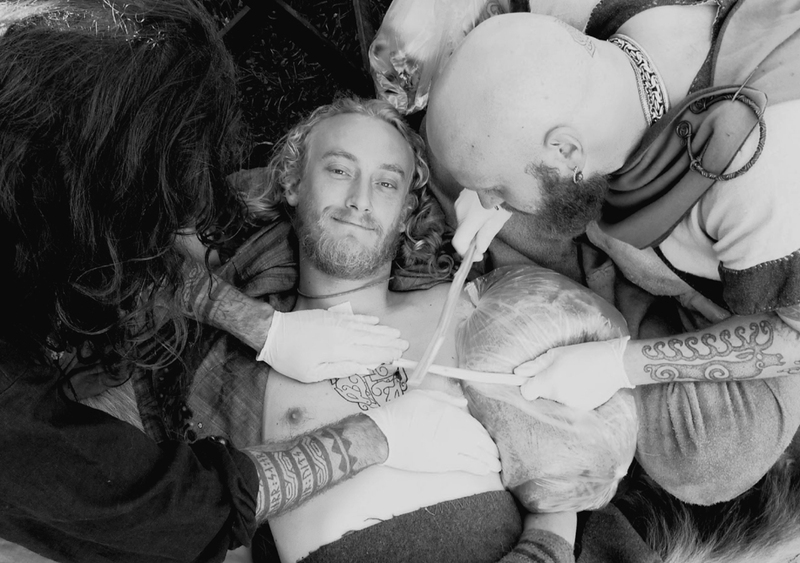 Viking culture is rich in art, religion, and intellectual life and these aspects of their society have been preserved in monuments, such as burials, church art, rune stones, and more recently tattooing. 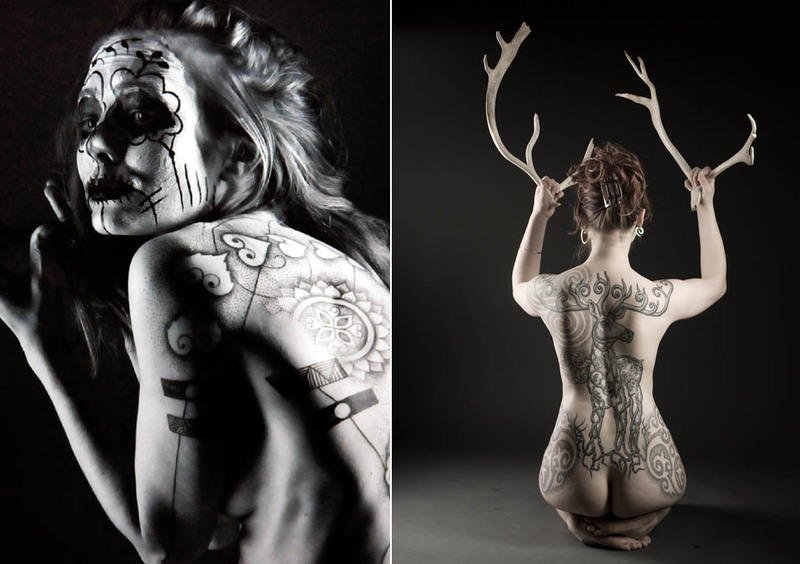 Nearly 25 years ago, pioneering Danish tattooists Erik Reime (Kunsten pä Kroppen, Copenhagen) and Jorgen Kristiansen (Mjølner Tatovering, Aarhus) resurrected the ancient tradition of Nordic skin art through painstaking research of Celtic, Pict, and Viking tattoos and passed this knowledge on to the next generation of Neo-Nordic tattoo masters, like Colin Dale (Skin & Bone Tattoo, Copenhagen) and German-born Kai-Uwe Faust who works with Reime in the Danish capital. While there is no firm evidence regarding the types of tattoo pigments used by the ancient Scandinavians, I (like Faust) suspect that they were probably derived from natural substances, such as charcoal and soot. The oldest evidence of tattoo in Europe is a 5300-year-old “Iceman” and it has been shown that his tattoos “were born of fire” and composed of vegetable carbon. Moreover, as I have traveled the Tribal world documenting tattoos, charcoal is definitely the most widespread pigment used in tattooing because it is sterile and takes to the skin easily, especially when hand-tapped, hand-poked, or skin-cut – techniques I should note that Faust excels in. After all, what good would a true Nordic tattoo artist be if he hadn’t cut his teeth wielding the traditional tools of his ancient ancestors?! Nordic Tattoo is organized into several chapters and accentuated throughout with stunning images by German photographer Christina Heinrich of H2 Fotografie. Since 2009, Christina has been producing dramatically lit photo shoots with Faust’s tattoo clients who bare all to expose his elegant work that enhances the contours of the body in a very naturalistic way. Christina also travels to major tattoo conventions across Europe (I have met her in Brussels and Frankfurt) to provide her clients with exquisite shots of their newly acquired tattoos in the comfort of her mobile studio. I have noticed a recent surge of interest in Nordic tattooing across the international tattoo community (eg., Marisa Kakoulas‘ recent tome BLACK TATTOO ART 2 features a chapter on the Nordic tattoo revival authored by Colin Dale). 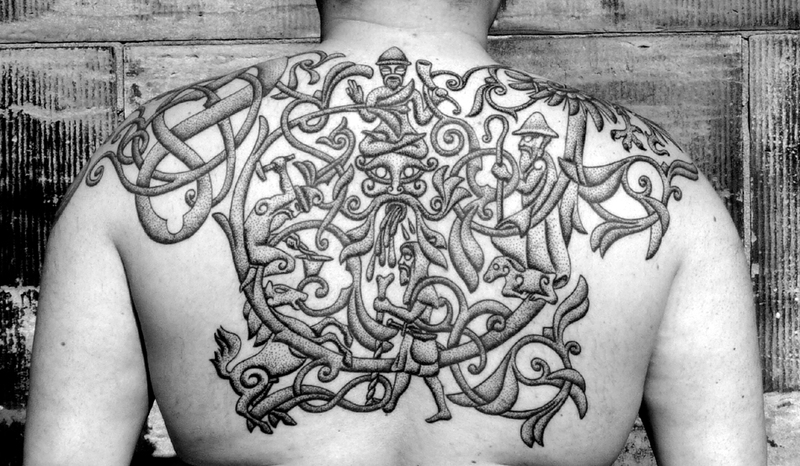 From Italy to Germany, Russia to the UK and beyond, tattoo collectors are very interested in the braided bands, writhing animals, and stippled organic forms that resonate with the life-power of the Nordic world. Bjørn with body suit by Astrid Köpfler and Dotwork elements by Kai Uwe Faust. While I agree with Faust’s observations, I do know one thing is for certain. Today, there is a new wave of Neo-Nordic artisans that have appeared on the horizon, bearing a symbolically rich and meaningful body of ancient Scandinavian tattooing tradition for all to witness and experience for themselves. 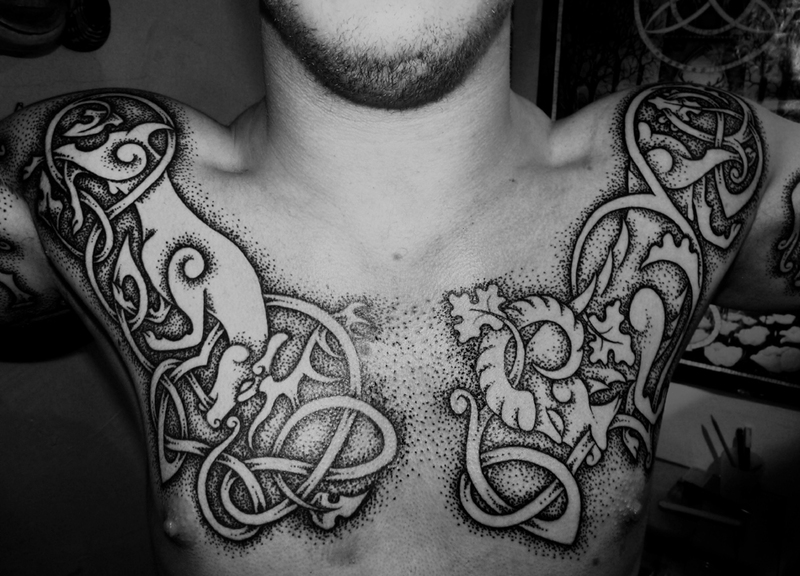 “Nordic Tattoo” captures the essence of this emergent world, and also the sacred body art of its many peoples.